"My name is Elizabeth Anne Hawkesmith, and my age is three hundred and sighty-four years. Each new settlement asks for a new journal, and so this Book of Shadows begins...."
In the spring of 1628 young Bess Hawkesmith learns that decisions made in desperation carry consequences that last a life-time, even if that means forever. The plague has taken the lives of her father, brother and sister. When Bess falls ill her mother does the only thing she can to save her daughter. She turns to the warlock Gideon Masters, and makes a deal that will cost her her life. Once known as a talented healer she is accused of witchcraft by townsfolk who refuse to believe that Bess' miraculous recovery was the result of her skills alone. Unable to deny the accusation she meets her fate on the Hanging Tree, but not before making Bess promise that she will seek protection from the only one with the power to save her - Gideon Masters. Under his guidance Bess learns to master the Craft, awakening powers she didn't know she had while also making her immortal. When the people of town turn their aggressions on Bess she realizes that she must escape - from the Hanging Tree and from Gideon and a his black magic. She couldn't have know that he would peruse her through time, determined to possess her and the power they could produce together. In present day England Elizabeth finds herself settled into a quite life. Alone she tends her gardens, and sells herbs and oils at the local market. Her solitary life is abruptly disrupted when a teenage girl called Tegan begins hanging around. Against her instincts Elizabeth takes pleasure in her company and her perceptive nature. Soon she begins teaching the ways of the hedge witch. 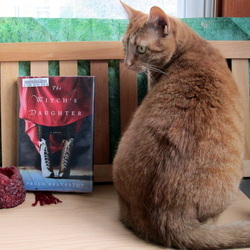 Tegan is an eager pupil, and Elizabeth uses tales of long ago to school her in what it's like to be a witch, and how she came to be who she is today. But what of Gideon? Has he finally given up or is he just patiently waiting for an opportunity to capture Elizabeth and make her his own?? It seemed fitting to read a book about witches this Halloween. I was drawn into this story right off the bat, although I did struggle a bit with the prolog. I filled it away with the hopes that it would make sense by end (it did, mostly...). There was an easy flow between the past and present as I got to know Elizabeth and Tegan. The stories from the past were interesting little vignettes that were unique on their own, but fit together to create a picture of who present day Elizabeth really is. There is a fair amount of "magic speak" that was foreign to me. Even thought I didn't understand the exact language (or words) I was able to glean enough of their meaning from the context. I suppose that's to be expected in a book about witches and magic. There are scenes of pretty graphic violence and the descriptions of some of the evil elements and even Gideon himself are quite vivid, resulting in some intense imagery. I can imagine the special effects for a movie version would be frightening indeed! I moved quickly through the book and in no time found myself nearing the end. I had in mind how I thought things might turn out, and I saw the potential for a variety of scenerios. And while I won't tell you how it all ended, I will tell you that I was disappointed. I felt gypped. It almost seems like Ms. Brackston just wanted to be done, and went with the most cliche ending while of course leaving plenty of threads that could be picked up in a sequel. In summary I'd say it was a good book with some interesting bits of history mixed with a few different relationships, dappled with magic and wrapped up with a predictable bow. Not bad for a seasonal selection, but I won't be going out of my way to read book two should it appear!